RIO DE JANEIRO, July 13 (Xinhua/Sun) -- Germany coach Joachim Loew has revealed he told Mario Goetze "to show you can decide the World Cup" minutes before the attacker's title-clinching strike. 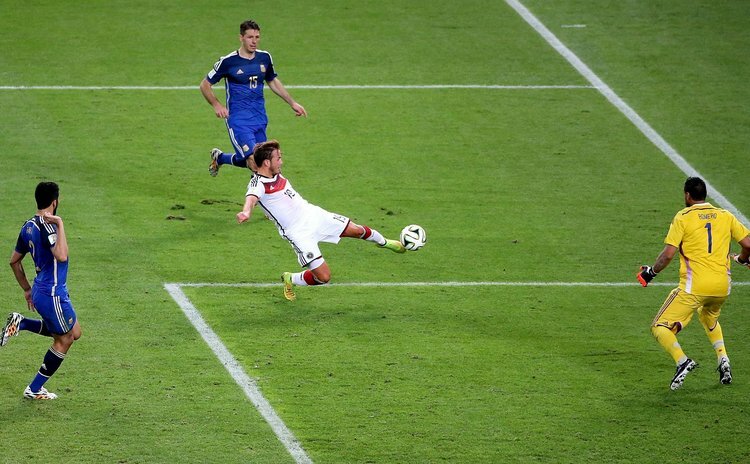 Goetze, a late substitute for Miroslav Klose, scored with seven minutes remaining in extra-time to secure Germany's fourth World Cup title in a dramatic final against Argentina. Loew took the Bayern Munich playmaker aside during the short break between extra-time halves at the Maracana stadium. "I said, 'Ok show to the world that you are better than (Lionel) Messi and that you can decide the World Cup'," Low said at his post-match press conference. "I said that he has all the capabilities to do that. I had a good feeling with him." Goetze, who failed to secure a regular first-team place in his first season at Bayern Munich in 2013-14, showed why the German giants paid 37 million euros for his transfer from Borussia Dortmund. The winning goal came when he controlled Andre Schurrle's cross with his chest before lashing an unstoppable volley past Sergio Romero. "It wasn't simple for me," the 22-year-old said. "I owe it to my family and my girlfriend for believing in me. I'm very happy that the team was able to get this title." Goetze, who was named man of the match in the final, dedicated the award to his teammates. "It is an indescribable moment. Every player deserves to be named here. We all deserve to have won this trophy," he added.